Yesterday, PGA Tour director Tim Finchem said that the Tour is not in favor of the anchored putting ban. While not going so far as to say that the Tour would not adopt the ban, a reasonable stance since the rule is still a proposal, Finchem did reassert the Tour’s right to establish its own playing conditions. He said the best way to avoid conflict over the matter would be for the USGA to rescind the proposal. 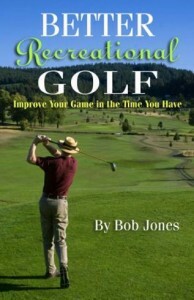 He also noted that since this technique has been part of golf since 1975, the USGA has given it tacit approval for almost forty years. A ban would have been more acceptable if it had been put in place much earlier than now. Finally, the only reason the USGA seems to have is that anchoring is not a traditional stroke–it looks odd. That’s no reason to prevent players, professional and amateur, who have built their golfing success on anchoring, from putting that way. The USGA’s comment period ends this Thursday, February 28th. Its final ruling will be made this spring. So far, the USGA has handled this issue like it did the greens at Shinnecock Hills in the 2004 U.S. Open. We can only hope the directors see that this is not the issue on which they want to stake their authority. These two pre-swing fundamentals are sometime confused and taken to mean the same thing. They refer to different things, and must be done correctly to put your body in the best position to put your best swing on the ball. Stance is where your feet are both in relation to the ball and your target line. Posture is the shape of your body as you address the ball. The following description is for a full swing. To get into your stance, take your grip with your right hand. Put the clubface behind the ball, aimed at the target. Step into your stance so your feet are parallel to your target line, and put your left hand on the grip. Your feet should be about 18 inches apart, but this depends on the club you’re using. With a driver, your feet will be a few inches farther apart, with a 9-iron, a few inches less. The ball should be in the center of your stance for any shot hit off the ground or irons off a tee. Put the ball two ball-widths forward of that to hit your driver or fairway metal off a tee. Stand up straight. Now push your hip straight back, keeping your head where it is. This will cause you to bend over at the hip, while not rounding your back or drooping your head. Even though you’re bent, you should still have the feeling of standing tall. Let your knees bend slightly, too. Your weight should be evenly distributed from the front to back of the soles of your feet. Look at your elbow as your arm hang downs at your side. Notice there is a slight natural bend in it. This is the full extension of your arm. If you straighten your arm, it’s now over-extended and tense. If there’s more bend than normal in your elbow, your arms are under-extended. Your swing movements will be constricted and weak. Hold the club with this natural bend in the elbows. With shorter clubs, the arms should hang straight down, relaxed, and at their full natural extension. With longer clubs you will stand straighter, so your arms cannot hang straight down, but there should be no feeling of reaching out for the ball. The shoulders should slant downward a bit from left to right, and the line across them should be parallel to the line across the hips. Do not let the right shoulder come forward so the shoulder line points to the left of the hip line. This is an easy error to make, and one that will make the direction you hit your shots inconsistent and unpredictable. Your head will fall slightly from its upright position when you bend over, but do not let that make you hunch your shoulders. Practice your stance and posture at home by leaving a club in a place you pass by frequently, and whenever you pass by, stop, grab the club, and set up. It only takes a few seconds, so there’s no reason why you can’t do it quite a few times a day. Every time you set up, not just going through the motions, but paying attention to every detail, you’re that much closer to having a good setup become a habit. You might think if the stance you have now is comfortable, it’s right. Comfortable only means habitual. Practice the right stance until it becomes comfortable. Check yourself in front of a mirror. 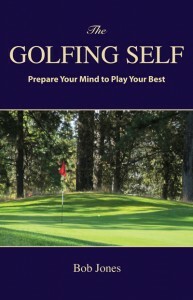 A stand-up mirror costs about as much as a round of golf and is an excellent investment in your game. I swing the club back to where my hands reach shoulder height. No more. That’s all the farther I can take it back and still feel like there is a psycho-physical connection between the clubhead and the ball, as there was at address. When I swing through the ball, I feel like I’m dragging the club through, straight at the target. This is my key to keeping my hands ahead of the clubhead. If I “drag” the club through but hit to the right, I didn’t turn my body enough. I have translated the 3:1 swing rhythm to a timed o-o-o-o-one, two! mantra. The backswing is not rushed, and the transition into the downswing is not rushed. When I do these three things right, I hit a darn good shot. In the old days when cars had carburetors, getting the ignition timing just right was critical to the engine’s performance. If the spark came to soon, the explosion collided with an upward-moving piston, making the engine work against itself. If the spark came too late, the explosion pushed on a piston well on its way down, applying power where there was no work to do. A golf swing is designed to put the clubhead in the right orientation at the moment it meets the ball. Given the mechanics to accomplish that, consistent tempo and rhythm ensure that happens at the right time, swing after swing. Let’s be sure we understand the difference between the two words. Both terms originated to describe music. Tempo is the overall speed of a musical piece. Rhythm is the varying duration of the tones being played. You can play “Stars and Stripes Forever” at two different tempos, but they will have the same rhythm. In the same way, two golfers might move through their swing at different speeds, but the rhythm of the swing should be the same. In December, I posted this comment on tempo, which explains the importance of swing tempo, and why it is slower than you might feel is right. I also posted this comment on rhythm, which gives you an explicit method of finding the right tempo for your swing and what the right rhythm feels like. Learn to groove the right rhythm first, using the procedure described in the aforementioned post. Then go to the range, with your metronome, and hit balls with that rhythm but at different tempos until you find the right one. It’s the swing that lets you hit your best shots and stay in balance throughout the swing. Believe me, when you find it, you’ll know. Spend a few weeks drilling this critical fundamental into your swing, and refresh yourself once a week or so during the golf season. You’ll love the difference it makes. Because of a flexible shaft and a heavy clubhead, both flung at a stationary ball at high speed, impact in golf does not lend itself to a simple description. From the top of the backswing to impact about 1/5 of a second elapses. The accelerating, clubhead builds up a considerable amount of speed. It meets the ball with a force of almost 2,000 pounds and remains in contact with it for 0.0005 seconds. During that time, the clubhead travels from 3/4” to 1”. 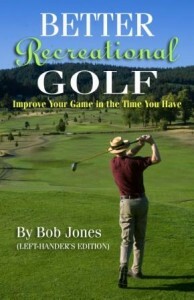 The force of impact with a stationary object, the golf ball, immediately slows the clubhead down by about 25 percent. Spin gets applied to the ball, about 3-4,000 RPM with a driver, and about four times that with a 9-iron. The heavier clubhead was in front of the shaft near impact, giving the shaft a concave shape in relation to the target. The collision of the clubhead and the ball slows the clubhead down more than the shaft, so the shaft flips into a convex shape in relation to the target. Centrifugal force built up at impact pulls on the player’s hands with a force of about 40 to 60 pounds. The golfer feels the shock of impact, but not simultaneously with the event itself. The vibration takes 0.00067 seconds to travel up the shaft to the player’s hands. By this time the ball has already left the clubface. From there the nerve impulse takes 0.01 seconds to travel to the player’s brain, by which time the ball has separated from the clubhead by almost 12 inches. Were the player to react in some way to the feel of impact, by the time a correction could be applied, the ball would be almost fifteen yards down range.